It is observed in full moon day of December. This year it falls on December 06, 2014 (Mangsir 20, 2071). Under Hindu Lunar Calendar it falls on Marga Sukla Purnima every year. This day is also the birthday of Guru Dattatraya. 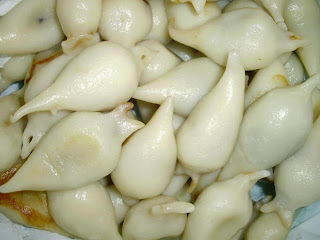 Yomari Punhi is observed during very cold days. It is said eating of yamari takes away cold. It is believed so long the tail of yamari as short the winter will be. Yomari is made by steaming a confection of rice-flour (from the new harvest) dough shaped like fig and filled with brown cane sugar (chaku) and sesame seeds. Yamari is the main item on the menu during the post-harvest celebration of Yomari Purnima. In Yomari purnima people also worship Goddess Anapurna. Annapurna is the goddess of grains and food. It is the time when farmers finish harvesting and taking rest after long day’s work. Kids gathered in groups go neighborhood to ask for yomari in the evening. Sacred masked dances are performed in the villages of Hari Siddhi and Thecho at the southern end of the Kathmandu valley to mark the festival. People believe celebration of yamari punhi brings them wealth, health and prosperity. People give different shapes to yomaris. Mostly yamaris are prepared in the form of gods and goddesses like Kumar, Ganesh, Laxmi and Kuber. Parents and elders bless children and give kids yomaris to eat. The children on the other hand perform the customary song and dance and ask for food and other gifts from the elders during the festival. The festival is believed started from panchal nagar (Panauti). It is said Suchandra and Krita, a married couple, first experimented with fresh yield of rice from their field. They came out with shape of yomari. The new food was distributed among the villagers. The food was liked by all, the bread was named yomari, which literally means 'tasty bread'. The couple offered yamari to Kuber (god of weath) who was disguised and passing by. Kuber was happy and disclosing himself blessed the couple with wealth. He also declared that whosoever prepare Yomari in the form of gods and goddesses on the full moon day of Marga Sukla Purnima every year and observe four days of devotion to god, will gain wealth and prosperity. The festival is celebrated for four days. All the four days people pray and worship. A big celebration is observed at night in Dhaneshwar Mahadev temple in Banepa. There is tradition of doing Deepavali at home. People worship god Kuber, Ganesh and goddess Subhadra in these 4 days. On the second day Yomari is prepared in the shape of gods and goddesses and stored inside the rice silo (bhakari) and worshiped. On the fourth day Yomari is eaten as Prasad and believed that those gods in the form of yamari enter to human body those worship and take yamari Prasad. People distribute yomari and rice to yomari asking kids home to home. In this day goddess durga is worshiped as Dhanyalaxmi or Annapurna mata. There is a tradition of making garland of yomari and putting to 2, 4, 6, 8, 10 and 12 years old kids on their birthday by their mother.